Environmental protection can be reasonable, whereas demands for it have often been characterised by fanaticism and irresponsibility, Professor Rognvaldur Hannesson argued at a conference held in his honour by RNH and the School of Social Sciences and the Economics Faculty of the University of Iceland Thursday 8 October 2015. In his lecture, Hannesson gave an outline of his recent book, Ecofundamentalism. There, he made a distinction between “wise use” environmentalism and ecofundamentalism where people ascribe special rights to “Nature” against man. Hannesson submitted that ecofundamentalism was religious in nature. He pointed out that almost all the predictions in Limits to Growth—which appeared in an Icelandic translation in 1974—have been wide off the mark; that the so-called precautionary principle is more of a paralysing principle, because it hinders experiments and therefore progress; that it remains unclear whether global warming is undesirable, as it is difficult to demonstrate that the present climate is the best one possible; that oil and coal are cheap sources of energy and simple to utilise; and that the rate of population increase has gone down in the last few decades, while food production per acre has vastly increased. Professor Rognvaldur Hannesson is an internationally renowned expert on resource economics, the author of around 100 refereed papers and six books. Professor Bengt Kristrom of Umea University in Sweden and Julian Morris, Director of Academic Studies at the Reason Foundation in the United States, responded to Hannesson’s lecture. 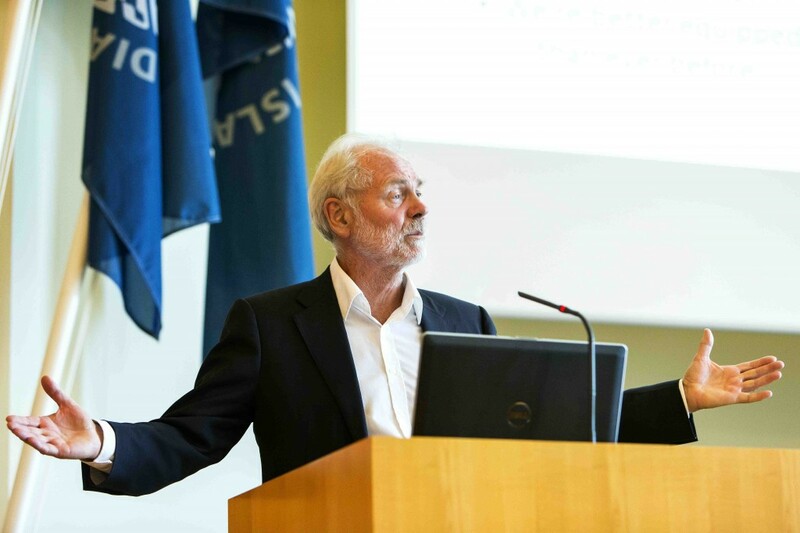 Dr. Dadi Mar Kristofersson, President of the School of Social Sciences, introduced Hannesson, and Professor Tor Einarsson, Chairman of the Economics Faculty, chaired the meeting which was well-attended. Whereas Hannesson has spent his professional career abroad, mostly at the Norwegian School of Business in Bergen, some of his old schoolmates from Iceland turned up for his lecture. On the day of the conference, Professor Hannes H. Gissurarson published in the leading Icelandic daily Morgunbladid an article on Hannesson’s book, describing some of the main arguments in Hannesson’s book. According to him, Hannesson’s message was similar to that of Bjorn Lomborg, whose book on the Sceptical Environmentalist was published in Icelandic in 2000, and of Matt Ridley, whose book on the Rational Optimist was published in Icelandic in 2014. In the evening, Education and Culture Minister Illugi Gunnarsson gave a dinner in Hannesson’s honour. The RNH participation in this event forms a part of the joint project with AECR, the Alliance of European Conservatives and Reformists, on “Europe, Iceland and the Future of Capitalism”.